What's with the weather this week? Lots going on: Supreme Court posturing, BP in denial, politics across the Atlantic, and a healthy anniversary. The forecast is a tumultuous one! 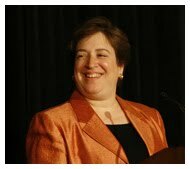 As predicted, Preside nt Obama nominated current solicitor general Elena Kagan to replace John Paul Stevens on the Supreme Court. And just as predictable, Republicans are gearing up for a big fight. Oklahoma's Jim Inhofe was first out the gate to voice his firm opposition of Kagan (he voted against her nomination for solicitor general as well). It's going to be bloody confirmation battle-the left and right are going after Obama's pick. Her nomination has also caused quite a stir in the Pennsylvania Senate race. On that note--how many teabaggers does it take to oust an incumbent United States Senator? Delegates at Utah's GOP convention gave Robert Bennett the boot, with a little help from the Club for Growth. They are looking beyond the west, seeking to influence another high-profile race in Kentucky. Also, Maine Republicans have sadly adopted the 'rational insight' of the Tea Party (and literally caused some damage, in the process). Stay tuned-this primary season is going to be a roller coaster! 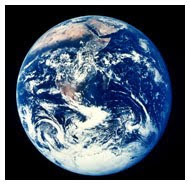 Senators Kerry and Lieberman introduced their version of climate change legislation on Wednesday. Missing was South Carolina's Lindsey Graham. Not feeling the love, Lindsey? Kerry and Lieberman still have a ways to go to find votes, and work with House colleagues, so it may be a while before we see any action. Obama's angry, really angry, at the Republicans. Can he rally the base before November? Seven more states announced they are joining twelve others to challenge the provision in the health care law that penalizes Americans who don't buy insurance. How long will this drag out? BP's effort to contain that massive oil spill in the Gulf of Mexico have so far failed. Looks like garbage is their backup solution. If that doesn't work, they'll use a tube. Execs of BP, Halliburton, and Transocean were on the Hill blaming each other for the mess. And BP FINALLY releases a 30-second video of the ongoing leak. Will anyone take full responsibility? The GOP candidate in Hawaii's 1st congressional district is on his way to victory. Get it together, Hawaii Dems! The DCCC has pulled out, and Obama won't endorse either Democratic candidate. Also, 14-term West Virginia representative Alan Mollohan was trounced in the Democratic primary. Republicans chose Tampa for their 2012 national convention. We wonder where convention-goers will be tempted to relax for entertainment. Where will the Dems hold theirs? Phoenix is feeling the pain from organizations relocating events elsewhere in the wake of Arizona's tough immigration law. And the governor disappoints us again by targeting ethnic studies courses. Meanwhile, the Governator was at Emory to deliver his commencement address and couldn't resist wading into the controversy. Afghan President Hamid Karzai was in Washington, D.C. as tensions between Afghanistan and the U.S. have cooled in recent months. 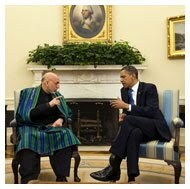 Karzai and Secretary of State Hillary Clinton acknowledged differences but pledged to work together. Laura Bush comes out in favor of gay marriage and is also pro-choice. A little PR stunt for her upcoming book? Of course. 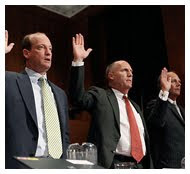 Supporters of auditing the Federal Reserve received a small gift this week when the Senate voted 96-0 to attach an amendment for a one-time audit to the financial services bill. Americans are also paying less taxes than they were since 1950. Devastating tornadoes touched down across Oklahoma and Kansas. 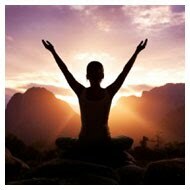 We're praying for you all and for a strong recovery. Space Shuttle Atlantis lifted off from the Kennedy Space Center in Floria for what is likely to be its last planned flight, ahead of the retirement of the current shuttle program. South Carolina Governor Mark Sanford spent some time in Florida, (not quite as south as Argentina), with his lover, mistress, er...whomever. Don't worry--he's only got months to go before he leaves office! 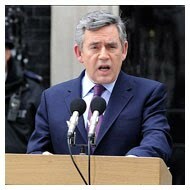 The end of Labour's reign in the United Kingdom: Gordon Brown resigned this week. So much back and forth negotiations. Want to read a blow-by-blow account of the flurry of events? And, was a big banker the person who sealed the deal? Greece is out of woods-barely. But it's going to take a heckuva lot of cash to pull the Eurozone out of this funk. German Chancellor Angela Merkel, took a hit for supporting the bailout. She's still got in in her! 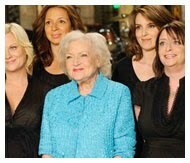 Betty White debuted as host of SNL. She rocked, and the ratings soared! Looking for an entertaining read? Newsweek's Jonathan Alter has a book due out next week, and it has some rather embarrassing tidbits about the French first couple. Sorry, Michelle! This week, Jon Stewart took a look at a Tennessee pastor who attracts people to his flock with a jab and a punch. Oy! Rihanna tries the Moonwalk. No one can be follow in Michael's footsteps. Law & Order fans are understandably saddened by rumors of the long-running show's cancellation. Good Ol' Fred Thompson shares his thoughts. Ohio Dems launched this website in response to a GOP ad attacking Lee Fisher. Provocative or just plain silly? Also, check out this ad running down in Alabama. Someone really wants to win! Ladies, technology will make you happier! But it's also an absolute necessity in the PR world. Does Obama really hate the iPad? Stealing legally: We smell a reality show coming! We'll give her a star for making the effort to arrest Karl Rove. Granny knows best! Oh, no, the series of tubes is running out of space. Tweeting can be such a life-saver. We have a couple folks here at Turner who swear by yoga to unwind, so we're letting you all know about Yoga on the Mall this weekend! Travel to Northwest, Greek enthusiasts, for a weekend of food, music, dance, and tours at the Saint Sophia Cathedral's Spring Greek Festival. If you have some more time, head out to Andrews Air Force Base, for the 2010 Joint Service Open House and Airshow. Seats are going fast for Turner's MediaMorphosis luncheon series, designed to teach nonprofits how to tell their stories in the changing media environment. Our very own Suzanne Turner will be moderating the first discussion, "Battered Journalism: Nonprofits to the Rescue?" Register before it's too late! Also, don't forget to tune in to Fem2.0 Blog Radio next Tuesday. We'll have New York Times journalist and best-selling author Judith Warner on the show to discuss her latest book. Elena Kagan's confirmation process will likely last through the beginning summer. The teabaggery won't go away, it seems, and woes for folks along the Gulf will be front page news for the foreseeable future. Katie Stanton, Queen of Snark, is on vacation in sunny Florida, and she'll be back next week. Give her a warm welcome back! Enjoy your weekend, and we'll see you next time!